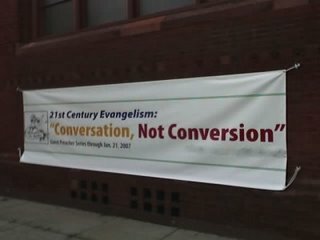 A category confusion of evangelism and conversion – In writing, “21st century Evangelism: Conversation, not Conversion”, they have confused two concepts which should never be confused. Evangelism is the God-given responsibility to Christians and to the church to proclaim the Good News of Jesus Christ. Conversion is the supernatural work of God to regenerate hearts that are spiritually dead. If we ever confuse these two concepts, it will either result in apathy and disobedience (when we think that evangelism is the work of God), or in coercion and violence (when we think that conversion is the work of man). Clearly, either of these errors will lead to terrible results. We must have a right understanding of evangelism and conversion as two distinct activities. Evangelism is more than conversation – Evangelism certainly can (and should) involve conversation and interaction. In fact, it is important that we understand where others are coming from and to treat them with dignity and respect. However, ultimately, evangelism is not a two-way dialogue concerning what is the truth. Ultimately, evangelism is a faithful proclamation of the Gospel of Jesus Christ, according to His revelation. In this day and age, such a proclamation might be considered arrogant or dogmatic, but true humility is not trying to make the Word of God more palatable to human tastes, but humbly accepting the Word of God and faithfully proclaiming it. True humility is submitting to the Word of God. Therefore, we must measure true success in evangelism as faithfulness to the Gospel.